It’s just another travel chat but there’s lots of room in that department, if you pardon that early-Internet-geek pun. The biggest and baddest of them that we in India want to attend take place when we are too numb to stay awake. Which is why, starting Thursday, January 16, @Living_Escaping and yours truly will host #TravelIST, where IST is Indian Standard Time. Very simply, it’s a chat scheduled at a sane time (8:30 PM – a perfect aperitif; or a digestif if you’re the yoga-doing type) for those in the IST time zone but at a not-so-insane time for those in GMT (3 pm) and EST (10 AM) time zones. And if you’re in Dubai (7 PM), it’s a perfect unwind ahead of your midweek weekend. Our topic for January 16 is one that you will surely have tons to say about: “Travel Dislikes”. Yup, we stole a march over Facebook on that. For those new to Twitter chats, here’s a primer (seasoned tweeps may skip this part and mark your calendars). 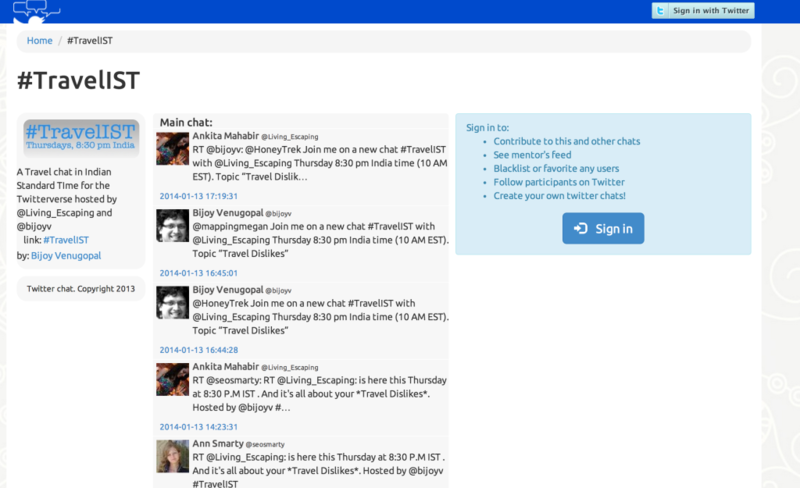 If you can’t join the chat (because it’s still an insane schedule for you) but would like to participate, login to twchat and tweet with the hashtag #TravelIST. But we recommend that you join while the chat is on, since our questions are a total surprise (pleasant, we hope). Want a prod aka reminder service? 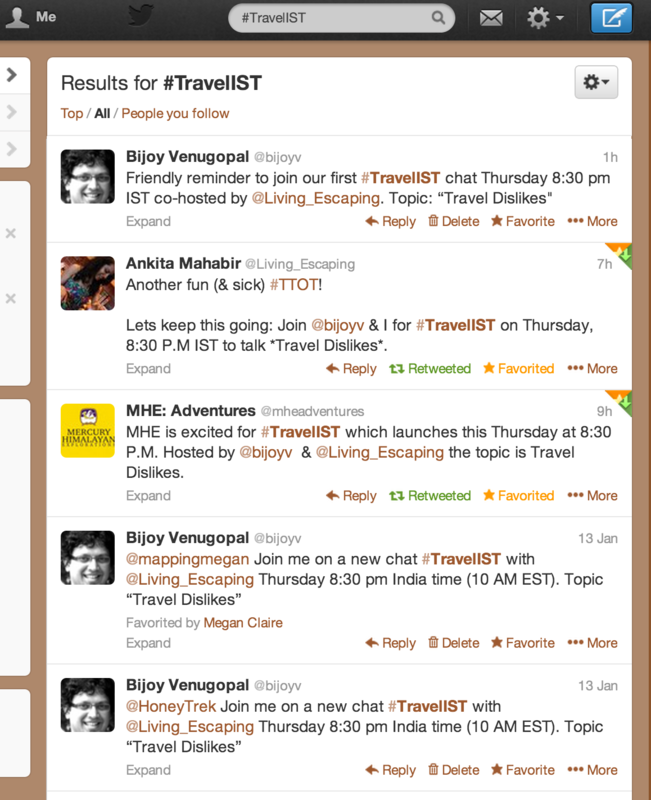 Follow @Living_Escaping or @bijoyv and we’ll be glad to do the honours!